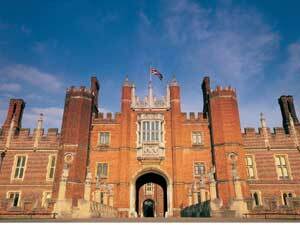 Hampton Court Palace0870 752 7777work Historic House500 years of royal history. Impressive architecture and opulent interiors of the state apartments and the vast Tudor kitchens. 60 acres of stunning riverside gardens including the world famous maze. Discover the flamboyant Tudor King Henry VIII, who is most associated with this majestic palace. Henry lavished money on fabulous tapestries and paintings, housed and fed a huge court and pursued a succession of wives, political power and independence from Rome. Come and enjoy the splendour, the opulence and the tales of the fascinating royals who resided at Hampton Court Palace for over 500 years. 500 years of royal history. Impressive architecture and opulent interiors of the state apartments and the vast Tudor kitchens. 60 acres of stunning riverside gardens including the world famous maze. 3, 4 and 5 April 2015: Please note that the Maze closes at 3:45pm and the gardens close at 4pm. Note Hampton Court Palace, the Maze and the Formal Gardens are closed 24, 25 and 26 December each year. For further information or to check that the above times have not been temporarily changed, please call 0844 482 7777 shortly before your visit. Adults £19.30; Children (5 - 16) £9.70; Children (under 5) free; Students (with ID) and Senior Citizens £16; Family £48.20. Adults: £18.20; Children £9.10; Students and Senior Citizens £14.90; Family £44.90. Palace, maze and gardens ticket prices bought at the palace, excluding the voluntary donation are: Adult £17.50; Child £8.75; Concessions £14.50; Family £43.80. Adults £18.20; Children £9.10; Students (with ID) and Senior Citizens £25.40; Family £46.80. Adults: £17.10; Children £8.60; Students and Senior Citizens £14.30; Family £43.50. Palace, maze and gardens ticket prices bought at the palace, excluding the voluntary donation are: Adult £16.50; Child £8.25; Concessions £14.00; Family £42.50. Group discount available to groups of 15 or more. The Maze at Hampton Court: Adults - £4.40; Children - £2.75; Family - £13.20. Formal Gardens only, Adults - £5.80; Concessions - £4.90; Children up to 15 - free.